The first season of “Friends from College” was so hard to watch, mostly because it displayed the worst parts of all of us. Although the first season was pretty unpleasant to sit through, what’s even less pleasant is being stuck in Michigan in January with no car; and so I found myself starting season two, albeit with low expectations. Watching the show, which follows a group of former Harvard classmates as they navigate their adulthood in New York City, felt like if you had stayed friends with your freshman hallmates for the next 15 years—years filled with the same stories, over and over, with people getting on each other’s nerves in the same ways and making the same mistakes, ad nauseum. The second season, which came out on Netflix on Jan. 11, was a noticeable improvement, with certain storylines developing in ways that were much more interesting and humor that was better executed. However, the show remained just-okay in a genre that is hardly original enough to justify mediocre execution. The season starts with the announcement of the upcoming wedding of Max (Fred Savage) and Felix (Billy Eichner). 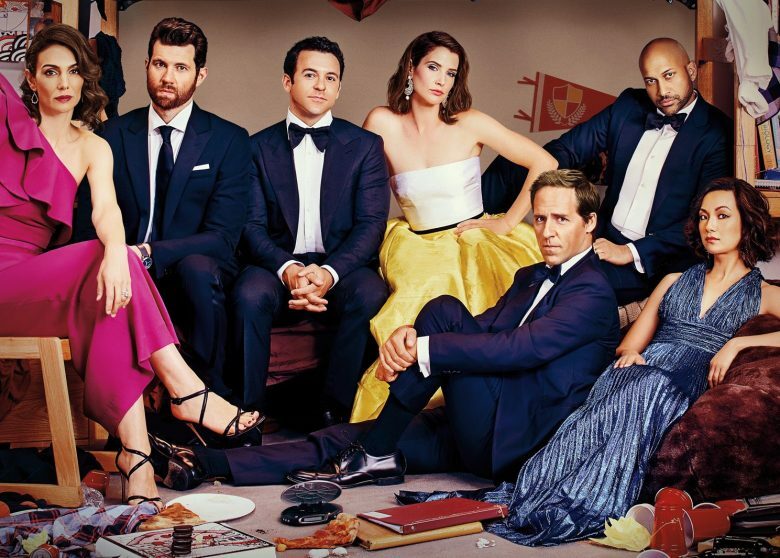 It is soon revealed that the event will bring together the group for the first time in a year, after an affair between Sam (Annie Parisse) and Ethan (Keegan-Michael Key) shattered any existing functionality in the friend group’s dynamics. The affair, which occurred in the previous season, proved so wildly unpopular with the show’s fans—if the show can even claim to have fans—that the producers decided that they could no longer sustain a plotline based solely on who did or didn’t know who was sleeping with whom. As the new season commences, Ethan’s wife, Lisa, has been ghosting him following the reveal of his affair with Sam. Ethan and Max have been working on a terrible YA novel. Sam has returned to her marriage with the truly boring Jon. And Marianne remains her quirky, lovable self, falling into a fling with a boy-child who jumps off of buildings for YouTube fame. It’s hard to tell just why the show falls so short. All of the recipes for success are there. The characters find themselves in several situations that have real comedic potential, such as Ethan’s job writing bad YA novels. But the dialogue is simply not well-written, and the humor is not specific enough to be relatable. Billy Eichner, who is the queen of playing annoying neurotic millennials, is on “Difficult People” what the characters in “Friends from College” have the potential to be—that is, a bad person whose obnoxiousness actually provides good comedic fodder. Although he doesn’t receive top billing in his role as Felix, the dominant and sarcastic husband of Max, Eichner’s impeccably snark and comedic timing provides a much-needed counterpoint to Max’s rather undeveloped characterization. But few other characters on the show live up to this standard. Cobie Smulders of “How I Met your Mother” fame is her usual, charming self, but she is given very little characterization to work with. And Jae Suh Park, as Marianne, makes what could be a throw-away, quirky character actually imbued with emotional intentionality. Sam, Ethan, and Lisa, however, all fall short, as does the supporting cast. This is especially disappointing in Ethan’s case because Keegan-Michael Key is so indisputably talented. When he is given the chance to work with good writing, as on “Key and Peele,” he kills it, but here, he is left with little to work with, and as a result his character just comes off as uptight and unlikeable. Plot-wise, so many aspects just seem like they came out of a writers room filled with bros drinking PBR and discussing their own failures and drunken endeavors. Take, for instance, the scene in which Sam gets trapped in the closet of a Polish club in Manhattan. Like, this is funny content if you have been trapped in the closet of a Polish club in Manhattan, but otherwise it pretty much falls short. The plot also falls into the common sitcom trap of failing to expand the worlds of any of the characters out of their insular friend group, resulting in several affairs and relationships within the small friend group that have little chemistry. Max, the token gay friend, is not allowed to participate in any of the incestuous drama because they would have to make a second character queer. Ultimately, “Friends from College” is proof that the sitcom formula does not always succeed, even with an experienced cast and even with Harvard educations. If “How I Met Your Mother” is to Wesleyan what “Friends from College” is to Harvard, at least the show manages to make me grateful that I didn’t go to Harvard.